Wala Kasmi has helped open the political system for young Tunisians. She is also enabling them to turn their skills as digital natives into jobs and prosperity. Wala Kasmi has helped open the political system for young Tunisians. She is also enabling them to turn their skills as digital natives into jobs and prosperity. Both strengthen democracy in Tunisia—rare in the region—and lessen radicalization. Wala's New Idea: Wala is propelling the youth leadership movement in Tunisia, inventing ways for young people to thrive as decision makers,active citizens and drivers of the new digital economy. Through her venture, YouthDecides, Wala continuously develops ways for young people to succeed; for example, her WeCode initiative trains young people to get jobs in technology or launch digital businesses. YouthDecides has also contributed to changing politics in the country; through a YouthDecides citizen-based effort, it is now mandatory that at least one among the top three candidates for municipal elections is under 35 years old and at least two among the top four candidates for parliament elections is under 35 years old. The first municipal elections since Tunisia’s 2011 revolution were held in May 2018. In 350 races, more than 60% of the candidates were under 35; and more than a third of those candidates won. The Tunisian Parliament officially expressed its support of the YouthDecides movement and publicly honored the initiative. To connect the YouthDecides network across the country, Wala drafts “community ambassadors” between the ages of 18 and 35 and trains them to recruit and lead teams of young people to participate in politics and use their technical skills for employment. Wala provides these young ambassadors access to a support system and a set of tools, further increasing participation and impact. The YouthDecides network has more than 4,000 members in four countries and Wala wants to spread YouthDecides across the entire MENA region. Wala continues to gain support fromthe government and corporate partners, such as Google,Orange and ESPRIT Incubator. 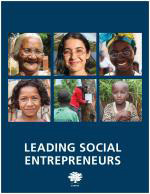 Wala's story appears in the 2018 edition of "Leading Social Entrepreneurs" which features a selection of just a few of the Ashoka Fellows recently brought into the largest global network of social entrepreneurs. The LSE presents some of the newest innovations by leading social entrepreneurs whose ideas are changing the way things are done all over the world.